In documents submitted to FAI, the E-152\1 was identified as E-166. Colonel Georgy Konstantinovich Mosolov made the first flight of the E-152\1 on 21 April 1961. The aircraft displayed at The Central Museum of the Air Forces at Monino, Russia as E-166 is actually the E-152\2, sister ship of the record-setting prototype. The Mikoyan-Gurevich E-152\1 shown with air-to-air missiles and a centerline fuel tank. The Mikoyan Gurevich E-152\1 is a single-place, single-engine delta-winged prototype all-weather interceptor. It is 19.656 meters (64 feet, 5.4 inches) long with a wingspan of 8.793 meters (28 feet, 10.2 inches). The leading edge of the wings are swept back to 53° 47′. The E-152\1 had an empty weight of 10,900 kilograms (24,030 pounds) and gross weight of 14,350 kilograms (31,636 pounds). The prototype was powered by a Tumansky R-15B-300 axial-flow turbojet engine with a five-stage compressor and single-stage turbine. It produced 22,500 pounds of thrust (100.1 kN) with afterburner. 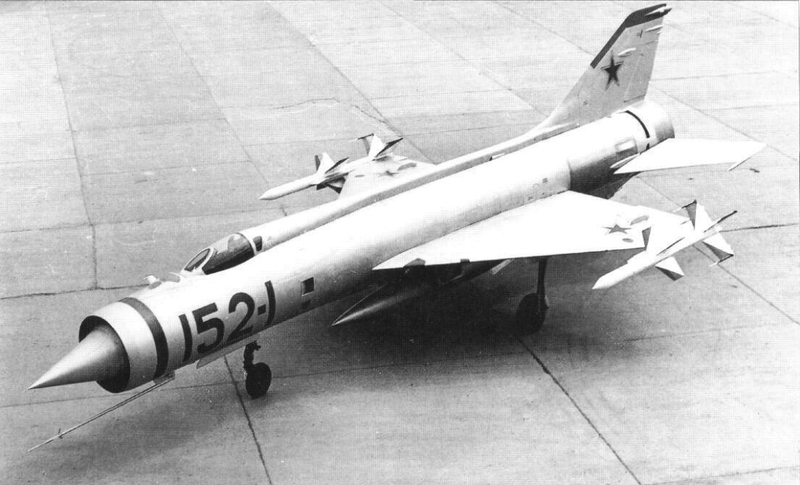 This was the first Soviet jet engine to use electronic engine control. The E-152\1 had a maximum speed Mach 2.82 (2,995 kilometers per hour, 1,861 miles per hour) at 15,400 meters (50,525 feet). The interceptor prototype had an internal fuel capacity of 4,960 liters (1,310 gallons), and the E-152\1 could carry a 1,500 liter (396 gallon) external fuel tank, giving a maximum range of 1,470 kilometers (913 miles). The service ceiling was 22,680 meters (74,409 feet). After a two-year test program, E-152\1 and its sistership, E-152\2 were converted to E-152M\1 and E-152M\2. Pyotr Maksimovich Ostapenko was born at Cool (or Cold), Kabardino-Balkaria, U.S.S.R, 17 September 1928. His interest in aviation began when, at age 14, he watched an aerial battle between Soviet and German fighters. Ostapenko attended the Armavir Military Aviation School of Pilots at Amravir, Krasnodar Krai, Russia, from 1948 to 1951, and then became an instructor. 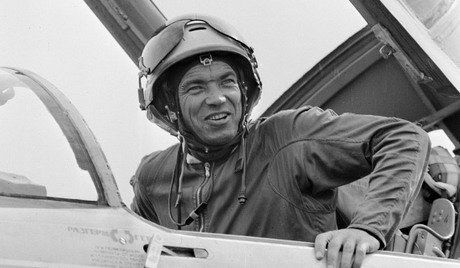 In 1958 he attended the Ministry of Indutrial Aviation Test Pilot School at Zhukovsky. He was a test pilot for the Mikoyan Design Bureau from 1958 to 1983. 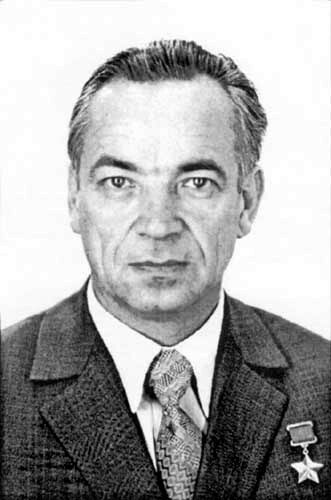 On 26 April 1971, Ostapenko was named Hero of the Soviet Union for his heroism in testing new aviation technology. He was also awarded the Order of Lenin and the FAI’s Henry De La Vaux Medal. Pyotr Maksimovich Ostapenko flew more than 5,000 hours as a test pilot in more than 60 aircraft types. He held seven FAI speed, altitude and time to altitude world records. He died 8 April 2012 at the age of 83 years. 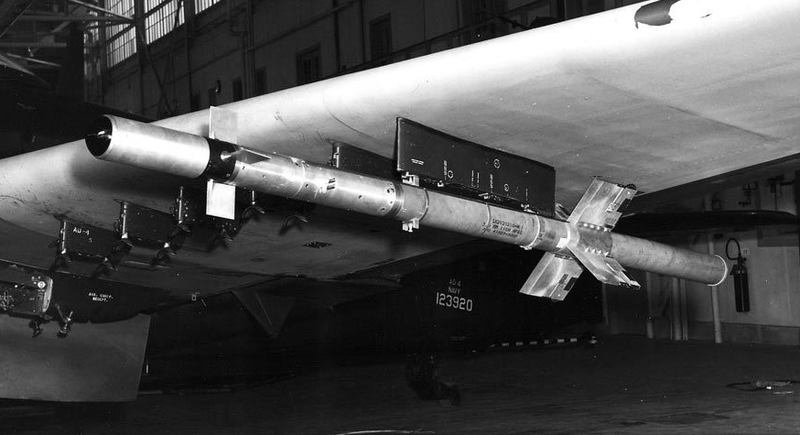 11 September 1953: At Naval Ordnance Test Station China Lake, the experimental Philco/General Electric XAAM-N-7 “Sidewinder” heat-seeking air-to-air missile scored its first “hit” when it passed within 2 feet (0.6 meters) of a radio-controlled Grumman F6F-5K Hellcat. 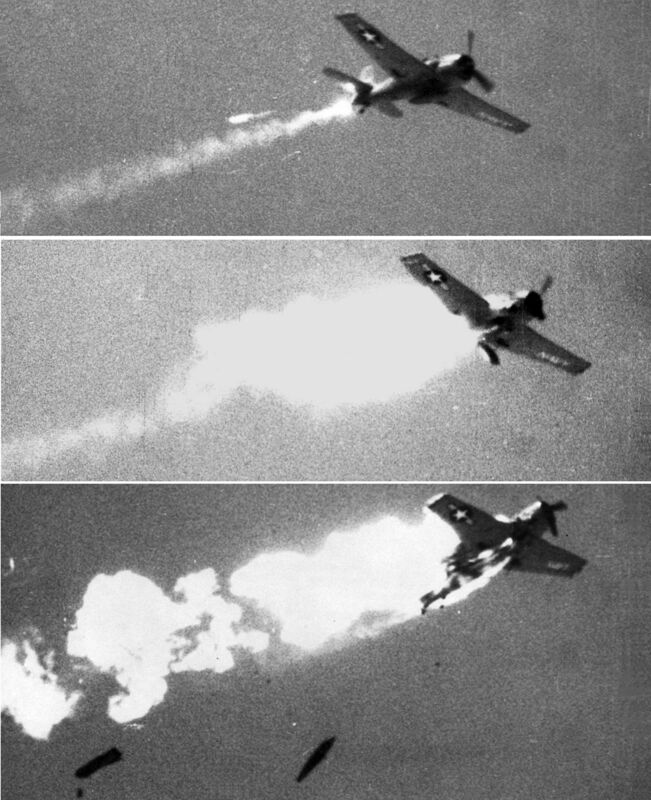 The missile was fired from a Douglas AD-4 Skyraider flown by Lieutenant Commander Albert Samuel Yesensky, United States Navy, the Officer-in-Charge (OIC) of Guided Missile Unit SIXTY-ONE (GMU-61). The Sidewinder was later redesignated AIM-9. It entered service in 1956 as the AIM-9B and has been a primary fighter weapon for 60 years. The AIM-9 Sidewinder is a Mach 2.5+ missile, equipped with an infrared seeker to track the heat signature of the target aircraft. 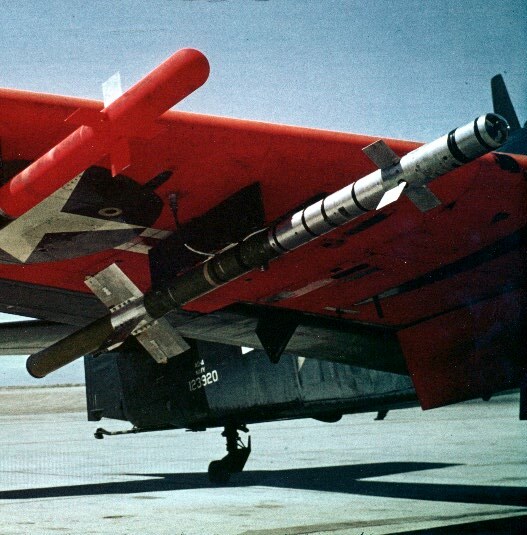 (The Hellcat drones used in the early test had flares mounted on the wingtips to give the experimental missile a target). The current production version, AIM-9X Block II, is produced by Raytheon Missile Systems, Tucson, Arizona. It is 9 feet, 11 inches long (3.023 meters), 5 inches in diameter (12.70 centimeters), and weighs 188 pounds (85 kilograms). The warhead weighs 20.8 pounds (9.4 kilograms). The missile’s range and speed are classified. At current production levels, the average cost of each AIM-9X is $420,944 (FY 2015 cost). Block III development was cancelled for FY 2106. Future Astronaut Wally Schirra flew many of the early test flights at NOTS China Lake. On one occasion, a Sidewinder came back at him, and only by skill and luck was he able to evade it. NOTC China Lake is now designated as Naval Air Weapons Station (NAWS) China Lake. It is located approximately 55 miles (88 kilometers) north-northeast of Edwards Air Force Base in the high desert of Southern California. 11 September 1946:¹ North American Aviation engineering test pilot Wallace Addison (“Wally”) Lien made the first flight of the North American Aviation XFJ-1, Bu. No. 39053. He flew from Mines Field (now, better known as LAX), to Muroc Army Airfield in the high desert of southern California. 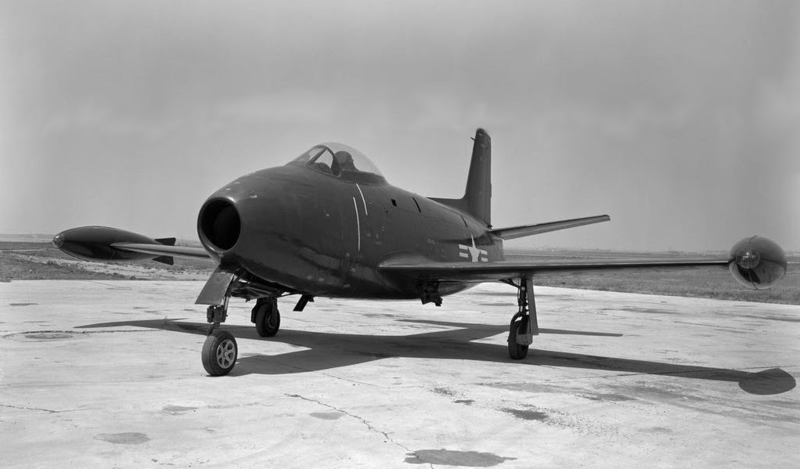 The XFJ-1 was a turbojet-powered day fighter designed for operation from the United States Navy’s aircraft carriers. It was a single-place, single-engine, low-wing monoplane with retractable tricycle landing gear. The airplane’s wings and tail surfaces were very similar to those of North American’s legendary P-51 Mustang. Although intended for carriers, the FJ-1 did not have folding wings to reduce its “footprint” when stored on the hangar deck. It did have an interesting feature, though: The nose gear assembly was capable of “kneeling,” putting the airplane in a nose-low, tail-high attitude, allowing Furies to be placed very close together when parked nose-to-tail. The XFJ-1 Fury was 34 feet, 6–3/16 inches (10.520 meters) long, with a wingspan of 38 feet, 2–9/32 inches (11.640 meters), and overall height of 14 feet, 10½ inches (4.534 meters). With the jettisonable wingtip fuel tanks installed, the wingspan was 40 feet, 11-3/8 inches 12.481( meters). The leading edge of each wing was swept aft 3° 40′. The total wing area was 274.88 square feet (25.54 square meters). The wings had an angle of incidence of 1° with 2° 30′ of negative twist. There was 3° dihedral. The horizontal stabilizer had a span of 17 feet, 7 inches (5.539 meters), with an angle of incidence of –1° and 10° dihedral. The vertical fin had 0° offset from the fuselage centerline. The XFJ-1 had an empty weight of 9,009 pounds (4,086 kilograms) and gross weight of 12,288 pounds (5,574 kilograms). 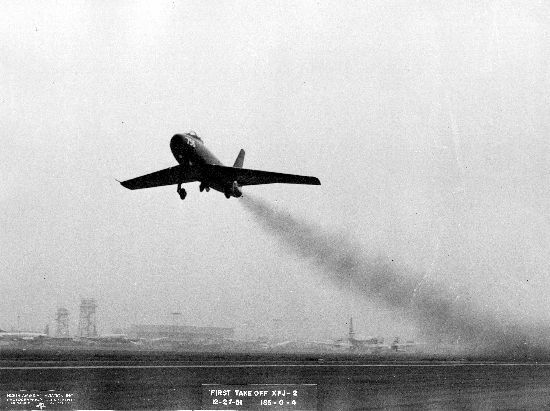 The XFJ-1 was powered by a prototype General Electric TG-180 (J35-GE-2) axial-flow turbojet engine. 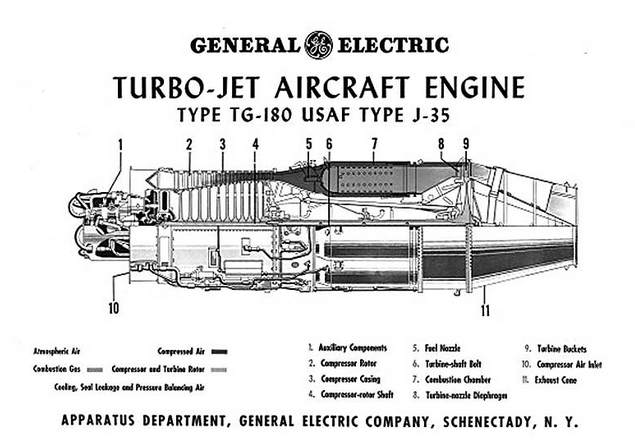 The J35-GE-2 used an 11-stage compressor, 8 combustion chambers, and a single-stage turbine. It was rated at 3,750 pounds of thrust (16.68 kilonewtons) at 7,700 r.p.m. The engine was 14 feet, 0 inches (4.267 meters) long, 40 inches (1.016 meters) in diameter, and weighed 2,455 pounds (1,114 kilograms). Production engines were built by Allison (J35-A-5 and -A-7) and by Chevrolet (J35-C-3). The production FJ-1 Fury was limited to a maximum speed of 415 knots (478 miles per hour/769 kilometers per hour), and when above 10,000 feet (3,048 meters), to 0.75 Mach. The service ceiling was 32,000 feet (9,754 meters). The FJ-1 Fury had three self-sealing fuel tanks in the fuselage totaling 465 gallons (1,760 liters). The wingtip tanks had a capacity of 170 gallons (644 liters), each. The total capacity was 805 U.S. gallons (3,047 liters) of JF-1 kerosene. 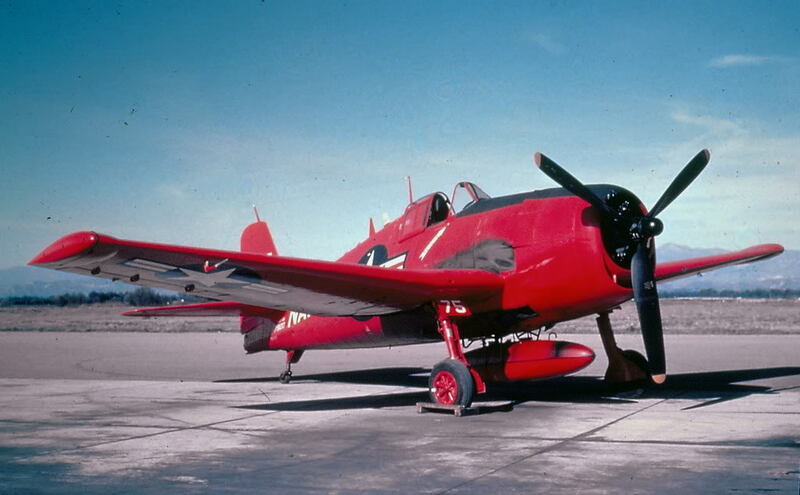 The XFJ-1 Fury was armed with six air-cooled Browning .50-caliber machine guns, with 250 rounds of ammunition per gun. 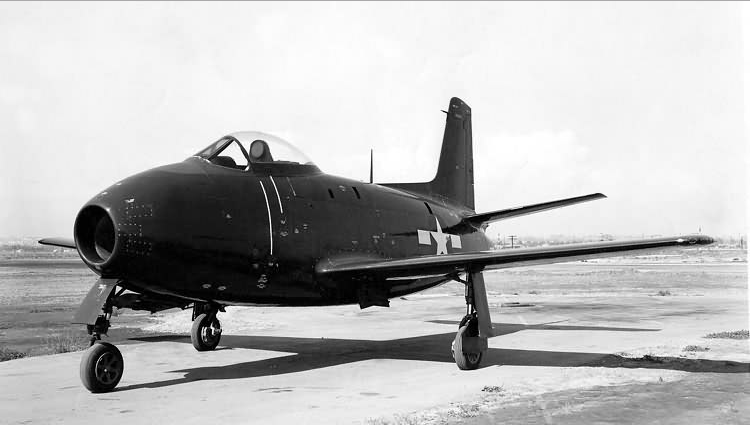 North American Aviation built three XFJ-1 prototypes and thirty production FJ-1 Fury fighters. The aircraft underwent a major redesign to become the XP-86 Sabre for the U.S. Air Force, and the FJ-2 Fury for the Navy and Marine Corps. Wallace Addison Lien was born 13 August 1915, at Alkabo, North Dakota. He was the second of six children of Olaf Paulson Lien, a Norwegian immigrant and well contractor, and Elma Laura Richardson Lien. Wally Lien graduated from the University of Minnesota Institute of Technology 17 June 1939 with a Bachelor’s Degree in Mechanical Engineering (B.M.E.). 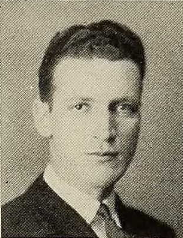 He was a president of the Pi Tau Sigma (ΠΤΣ) fraternity, a member of the university’s cooperative book store board, and a member of the American Society of Mechanical Engineers (A.S.M.E.). He later studied at the California Institute of Technology (CalTech) at Pasadena, California, and earned a master’s degree in aeronautical engineering. Lien worked as a an engineer at a steel sheet mill in Pennsylvania. He enlisted in the the United States Army at Pittsburgh, Pennsylvania, 18 February 1941. He was accepted as an aviation cadet at Will Rogers Field, Oklahoma City, Oklahoma, 11 November 1941. 26 years old, Lien was 6 feet, 2 inches (1.88 meters) tall and weighed 174 pounds (79 kilograms). During World War II, Lien remained in the United States, where he served as a test pilot at Wright Field, Dayton, Ohio. 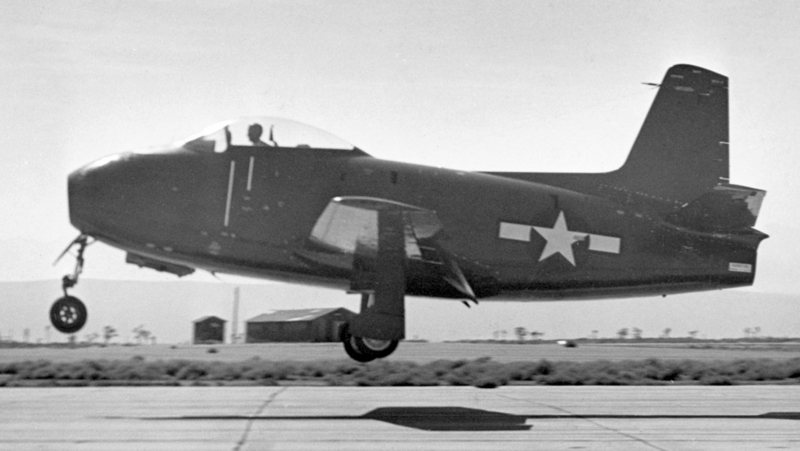 He conducted flight tests of the Bell YP-59A Airacomet and the Lockheed XP-80 Shooting Star. Having reached the rank of Major, he left the Air Corps, 16 February 1946. He then went to work for the Republic Aviation Corporation as a test pilot, and North American Aviation. Wallace Addison Lien married Miss Idella Muir at Elizabeth, New Jersey, 26 December 1946. They would have two sons, Robert and Steven. Wallace Addison Lien died 28 October 1994 at Colorado Springs, Colorado, at the age of 79 years. He was buried at the Shrine of Remembrance Veterans Honor Court, Colorado Springs, Colorado. ¹ Sources very, with some stating 12 September or 27 November 1946. 11 September 1920: At 2:33 p.m., Edison E. (“Monte”) Mouton landed at Marina Field near The Presidio of San Francisco, completing the final leg of the first transcontinental air mail flight by the U.S. Postal Service. Airplane No. 151 carried 6 sacks of First Class mail from Mineola, New York. Mouton, a pilot assigned to Salt Lake City, taking over the flight for another pilot, flew No. 151 from Reno, Nevada, to San Francisco, California, a distance of 250 miles (402 kilometers), in 1 hour, 58 minutes. The mail sacks were immediately taken from the airplane to the central post office, where they were distributed. 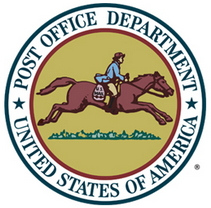 Two of the mail sacks were sent to Washington State and one sack to Oregon on the 4 o’clock train. The entire cross-country flight had taken 75 hours. Edison Esadore Mouton was born in California, 10 December 1894, the first of three children of Edward E. Mouton, a farmer, and Gertrude F. Winters Mouton. Monte Mouton, then living in Carson City, Nevada, enlisted in the U.S. Army when the United States entered World War I. He served as a pilot with the Lafayette Escadrille in France during World War I, and was commissioned a second lieutenant, Air Service, American Expeditionary Forces. He rose to the temporary rank of colonel. Lieutenant Mouton was honorably discharged 14 May 1919. He was later an officer in the Air Corps Reserve, holding the rank of major. 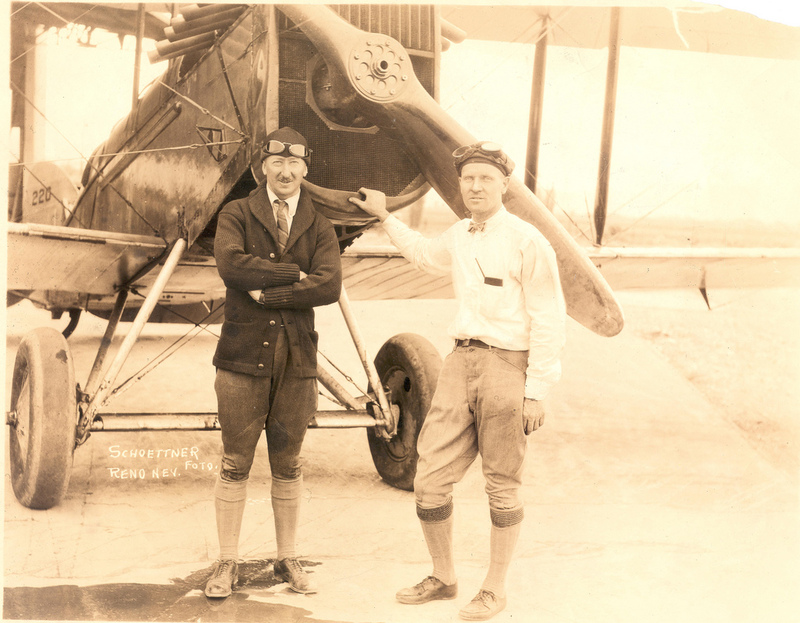 Mouton was employed by the United States Aerial Mail Service from 8 September 1920 to 22 May 1927. During that time, Edison flew 3,804.54 hours and covered 369,730 miles (595,023 kilometers), flying the mail. He then became a supervising inspector for the Department of Commerce, serving for six years before resigning to enter private industry. Mouton was vice president and general manager of Nevada Air Transport, Inc., a regional airline serving the state of Nevada. Edison E. Mouton married Miss Claire Yerington, 27 April 1921, at Reno, Nevada. (“Yerington,” as in, Yerington, Nevada. Miss Yerington’s grandfather was the superintendent of the Virginia and Truckee Railroad, which serviced the “Comstock Lode” silver mines.) Miss Yerington was described as “a strikingly beautiful blonde,” and “an intrepid devotee of the air and knows the intricacies of an automobile as well as any mechanician.” They divorced in November 1928 but were remarried 20 March 1929. They had two children. Edison Esadore Mouton died at San Francisco Airport, San Francisco, California, 5 July 1940, an apparent suicide. He is buried at the San Francisco National Cemetery, San Francisco, California.